With the promise of settled weather for the week, and no rain, we left Upton to tackle the northern half of Offa’s Dyke. While the minibus went to Newcastle on Clun to pick up where we left off in June, I drove all the kit to Rhyd-y-Groes, near Welshpool, to set up camp. It was a hot day, and whether you were slogging up and down the steep hills just north of Newcastle, or putting up tents and shelters, you worked up a good sweat. After four hours all was set up so I set out to meet the group coming towards me. Only they weren’t coming towards me. 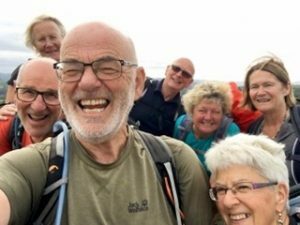 Five miles from camp they came upon Mellington Hall where they found they could enjoy a much deserved, delicious, afternoon tea. I was encouraged to join them but, as it would most likely take me at least an hour and a half to walk the distance from camp, it was never going to be likely. As it was, I met them about 10 minutes from Mellington Hall, and thus missed out on my much deserved treat. Perhaps, had I not stopped to talk to Bob, a lone walker, for a few minutes, I might just have made it. Instead, I returned to camp with the group, treatless! Bob, or Rob, I was never quite sure which, was an interesting character. On my recommendation he had set up camp across the field from us. Being alone, we quickly invited him over for supper. While the food was most welcome, what he enjoyed most was the opportunity to communicate with people. Having been brought up in the area he was now walking through, he had spent most of his adult life working in schools in Scotland, largely in outdoor education. He seemed to be able to turn his hand to most things linked with the outdoors. In 1997 he attempted Everest from the north side but was forced to abandon his attempt because of bad weather. He had sailed across the Atlantic three times and the Pacific once, and soon after finishing Offa’s Dyke, he was flying down to New Zealand to continue with his sailing around the world. The nice thing about bumping into people on a trek like this is that they all have a story to tell, some rather more interesting than others. As we set off the next morning, Angela took Rob a bacon butty for breakfast. We climbed immediately up the hill from the Pound House and looked back at the Vale of Montgomery, the scene of one of the bloodiest battles of the First English Civil War in 1644. After the Royalist’s catastrophic defeat at Marston Moor, the Parliamentarians went on the offensive and captured Montgomery Castle. 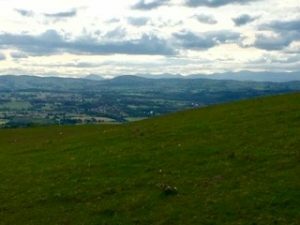 Wales had always been a Royalist stronghold so, in order to protect that loyalty a large Royalist Army was sent to the Welsh Marches to dislodge the Parliamentarians from Montgomery Castle and regain control. Unfortunately things did not go according to plan, the Royalists losing 500 men while the much smarter and capable Parliamentarians only lost 30. A little later on we were walking along a stretch of the raised dyke with the sun in the east. The shadows cast caused some mirth when we realised that the evolution of man had not taken the course that we have all been taught. The shadows cast prove, beyond any doubt, that man evolved from tortoises and turtles. The photo clearly proves the theory. 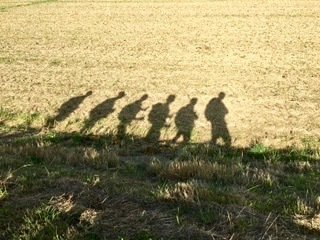 I wonder if you can identify the owners of the shadows? The one on the right is easy but do you recognise the fifth and sixth in line? They are a long way back in the evolutionary timescale! Later in the day we came across a scene that beggars belief. 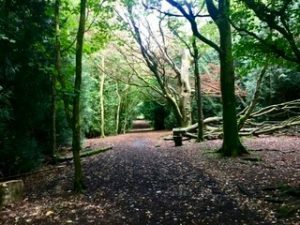 We walked up a steep track adjacent to some woodland. 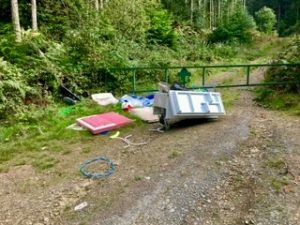 At the top we discovered a washing machine, a fridge and a mountain of other household detritus, dumped. The effort that they must have taken to dispose of their possessions in this way was far greater than if they had taken it to the tip. Some of it, particularly the children’s toys, were in reasonable condition and could easily have gone to a charity shop. What goes through people’s minds when they behave like this? They must have a completely different mindset to normal people! 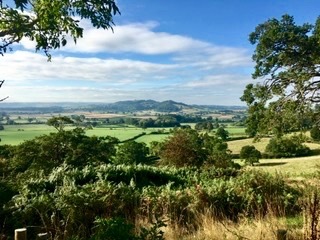 Having spent the early part of the day undulating over highland, we descended into the Severn Valley at Buttington and then spent the latter part following the river and the Severn Way. We stopped briefly in the Powis Arms Hotel where an unsavoury character behind the bar sullenly served us a drink. It is not a place I would rush back to. The walking along the banks of the Severn (not that we saw very much of the river) was much easier but it also proved to be tedious. There was little or no variety, simply walking along the flood defences crossing field after field. It was a bit of a relief when we reached Rhyd-esgyn and Angela arrived to pick us up in the minibus. Day three was damp. Hang on. At the beginning of the week we were promised settled dry weather. How could they get it so wrong? Angela took us back to the Rhyd-esgyn and we continued our trudge along the river. 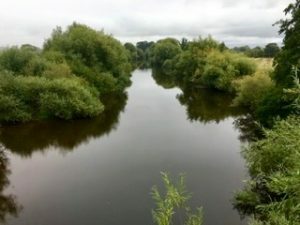 I have always had it in mind that I might, one day, like to walk the Severn Way, but this experience, if it has achieved anything, has told me not to waste my time. While parts of it may well be very interesting, there are large sections of it where it is not. Leaving the River Severn behind, we picked up the Montgomery Canal near Four Crosses and followed it round, crossing the River Vyrnwy via a small aqueduct. The River Vyrnwy was much bigger than the Severn had been and looked significantly more interesting from the aqueduct. Shortly afterwards we walked into Llanymynech where we found a cafe that served the best chocolate brownies, ever! While there the rain fell even heavier and before we left we had to don all of our wet weather gear for the climb out of the village. The climb, although steep, was interesting as it took us through an industrial, quarried landscape, with remnants of times gone by. As we climbed steeply up through the trees we began to realise that this was an old tramway, the means by which the stone was transported down the hill. Tunnels led through the hill from the Welsh side to the English side. Had the weather not been so horrible, we might have explored the area more thoroughly. As it was we just needed to keep going. Because we had our heads down, we were making good progress. Our day’s target was Nantmawr but we were going to reach it in good time, so we decided that we would cut short the next day’s walk by going on to Trefonen. We stopped for lunch in Nantmawr, sitting in the parking space outside a house in the village. There was nowhere else suitable! At least it had by now stopped raining. Afterwards we continued to Trefonan, finishing in the carpark to the Barley Mow Inn and Offa’s Dyke Brewery. Unfortunately, neither were open, so we allowed Angela to take us back to camp. We were covering the distances well and we had just one more day before we needed to move camp. 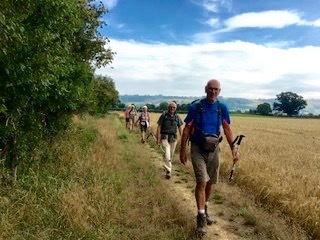 It was a much better day again and, as we headed north, we were walking through some delightful countryside, a mixture of ridge, forest and pasture land. At one point, while walking through the delightful woodland, we paused for a break. David, Claire and I were a little away from the rest of the group. They were all deep in conversation. I suggested we hide. The three of us took ourselves deeper into the woodland and waited to see if there was any reaction. There was absolutely none. They carried on without us, not a hint of concern in their conversation as they walked by us. 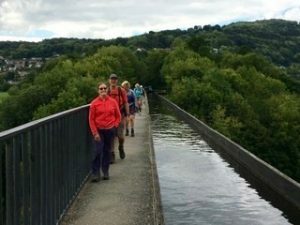 The walking was relatively easy, and because we had covered some of the distance the day before, we were able to finish at Pentre, where we joined the Llangollen Canal, reasonably early in the afternoon. The following morning dawned as one of those perfect mornings. 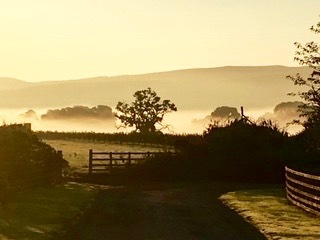 The sun was shining right from the start but with temperature inversion there was a mist clinging to the ground. A super way to start the day. Before we could do anything we had to strike camp and pack everything away in the van for me to set up camp further north. Rhyd-y-Groes had served us well. It is a superb flat site, well maintained and the facilities were second to none. Helen Davies was welcoming and accommodating and we wanted for nothing. By 9.00am we were ready. 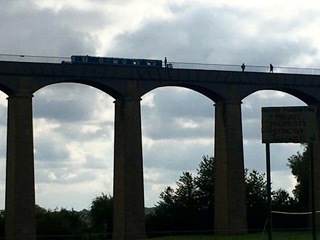 I was not doing the full walk today, as I was going to set up camp, but neither Angela or I wanted to miss out on the opportunity to see and walk across the Froncysyllte Aqueduct, a World Heritage Site, carrying the Llangollen Canal over the River Dee a long way beneath. Here, the canal is very busy with narrow boats queuing at each end to take their turn. I thought there might be some form of control, but there appears to be none. It seemed to cause some anxiety to those wanting to cross. Walking across caused us no logistical problems, but the exposure, however safe you might be, left you feeling slightly giddy. Having crossed, we enjoyed a coffee before Angela and I left the group to continue with their northward journey while we walked down to the road bridge over the Dee. This gave us an opportunity to look up at the aqueduct, which is probably even more spectacular than being on it. This led us back to our vehicles and on to Llyn Rhys Campsite where I spent the bulk of the remainder of the day setting up camp in readiness for the group to walk into after their hike, a hike that, I must admit, I wished I could have done. It took them over some wonderful moorland, affording panoramic views across North Wales to Snowdonia. They arrived in camp very satisfied with their day, and extremely grateful to see camp set up with kettles boiling and cake served. The next day we started to walk along the chain of the Clwydian Range. Unfortunately, the weather had turned again and it was simply a matter of heads down and get it over and done with. There was a strong, cold wind blowing so there was little or no desire to stop along the route. There were also no photos as there was nothing to capture as our heads were in cloud most of the day. I think it is fair to say that I can be quite competitive, not necessarily with other people but also against myself. During the course of the walk we had a long steady climb. I was in the lead but I sensed somebody was at my right shoulder. I thought it was Trevor, who, at 75 years of age, is incredibly fit. I was about to turn to him to tell him to act his age and slow down, when I discovered it was Celeste who was pushing me up the hill. I was not going to be beaten. As hard as I pushed myself, Celeste kept up the pace, although she was pole assisted while I was freestyle. I really could have done with a rest but I was not going to give in. Near the top, I paused to look round to see where the rest of the group were. Celeste also paused and was caught off guard when I sped up the last few metres to the top! Testosterone 1 Oestrogen 0. Later, Trevor took on the challenge with Celeste, and although he is almost 26 years her senior, he beat her to the top. Perhaps she was tired from trying to keep up with me earlier. Testosterone 2 Oestrogen 0. How satisfying is that? At least it kept us warm. We were only grateful that our finish at Bwlch Penbarra coincided with Angela arriving with the minibus to whisk us back to camp before we became really chilled. Cloud still hung about the tops and there was still a little rain in the air as we set off the next day from Penbarra to cover the northern half of the Clwydian Range. As the morning progressed the weather improved and we were treated to some far reaching views across to Snowdonia where we could identify the major peaks of Tryfan, the Gliders, Snowdon, and the Carneddau. 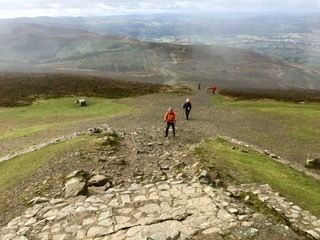 Before we could see these magnificent views, we had to climb Moel Famau, at 554m, the highest point of our ridge walk. On the summit there is a partly built beacon, started in 1810 to celebrate the jubilee of George the Third. Poor foundations meant that it was never finished but renovation work was done in 1970 to restore it to its present state, without the tower that the original architects envisaged. There was still a cold wind blowing across the summits. It was a delightful walk, only spoilt by the fact that I was having trouble with my left knee, and then my back. In the end, David forced some pain killers down me and I was able to continue, gingerly. The forecast for our last day was pretty diabolical, so we decided to capitalise on the good weather of the day and walk further than planned. Originally we planned to finish in Bodfari, leaving us with twelve miles to cover in the forecasted heavy rain. 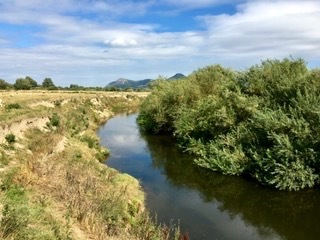 So, to reduce the misery, we decided to continue on to Rhuallt but not before we enjoyed copious cups of tea, chocolate brownies and ice cream is a very smart pub in Bodfari. The church bells next door were peeling out a very sombre tune, causing us to assume that there was a funeral. It was only as we were having our treats in the pub that very smart, brightly dressed people with button holes came in. It was a wedding. The walk along to Ruallt was a bit harder than expected and took the daily distance up to 15 miles. It would not ensure that we would stay dry the next day but it would save us at least two hours of misery. The last day was wet and it did not take very long for the rain to penetrate our waterproofs. The fact that we were moving kept us warm. I had anticipated that it was going to be a pretty easy walk as we were now on the coastal plain. Not so. Just when we thought we were close to the finish and we could see Prestatyn, there was a sting in the tail. 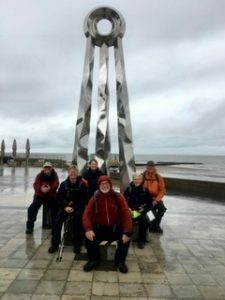 The route took us steeply up to the top of the cliff, away from our final destination, presumably to give us outstanding panoramic views of Prestatyn, the North Wales coast and the masses of wind turbines about a mile off shore. But their was nothing to see as the climb took us up into the murky cloud. I think that is when I felt at my lowest on the whole of the trip. It seemed so pointless. On a good day, I am sure it would have been magnificent, but not on this day. Eventually we dropped down into Prestatyn, which turned out to be a much pleasanter town than I was expecting. There we marched through the rain sodden streets to the end of Offa’s Dyke. We had covered, in the two legs, 177 miles of, largely, beautiful country. Having completed the walk we went into a nearby cafe where we could get out of some of our wet outer clothes and drink some warming tea and coffee. The weather may not have done what it promised at the start, but, let’s face it, it would be boring if the sun shone all the time. Over the two legs, we have had a lot of fun and I am extremely grateful to everyone for the enjoyment they brought to these trips. I am also extremely grateful for the support given me by David (even if he does get his distances wrong), Angela and Annie who tirelessly work to make camp and the logistics run smoothly. Next year we are walking the Two Moors Way. If you haven’t booked already, I am afraid it is too late. We are full.